There are several species of bats, however, the only two that are generally a problem in the Midwest are the Big Brown Bat and the Little Brown Bat. The little brown bat's wingspan is 9-10 inches and their body is shorter than your hand's width. They live in large colonies. They migrate, generally leaving in October and they will come back to the same house around May. The large brown bat's wingspan is 13-14 inches and the body is longer than your hand's width. They live in much smaller colonies, around 5 or 6 in a house. They do not migrate and will sometimes stay in the same house over the winter, moving down in the walls or under an attic floor to stay above freezing temperatures. More often than not, the will seek a nearby cave, storm sewer, or other cool, humid climate to stay. Bats urine and droppings cause odors and they can carry a bug, called bat bugs, that are very similar to bed bugs. 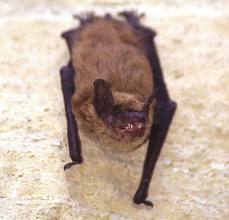 Bats that die in a building can produce flesh-eating insects like bottle flies and dermestid beetles. Bats can carry rabies, but it is fairly uncommon. Bats have sharp teeth and, if provoked, will bite. Never handle bats, even a dead one, with bare hands. Always wear protective gear when handling a bat. If you are bit or scratched by a bat, trap it in anyway possible (if necessary, kill it) since it will need to be tested for rabies. Bats do not need much room to enter a house. A 3/8" wide crack or hole is more than enough for them to get through. Usually they enter at the eave level of a building. They will often crawl under loose shingles. Often you can see where they are entering by watching for them around dusk. This will help identify exactly where they are getting in. The best way to control bats living in a building is to find where they are entering. Then fasten some wire mesh over their entrance, leaving it loose at the bottom so they can still exit. The flap should be 3 or more feet below the exit hole. This will allow the bats to safely leave the house, but when they come back, they will not be able to re-enter. It is best to install these one-way doors in either the spring before the young are in or in the fall when they are old enough to exit on their own. If you need help with bat proofing your residence please contact us!